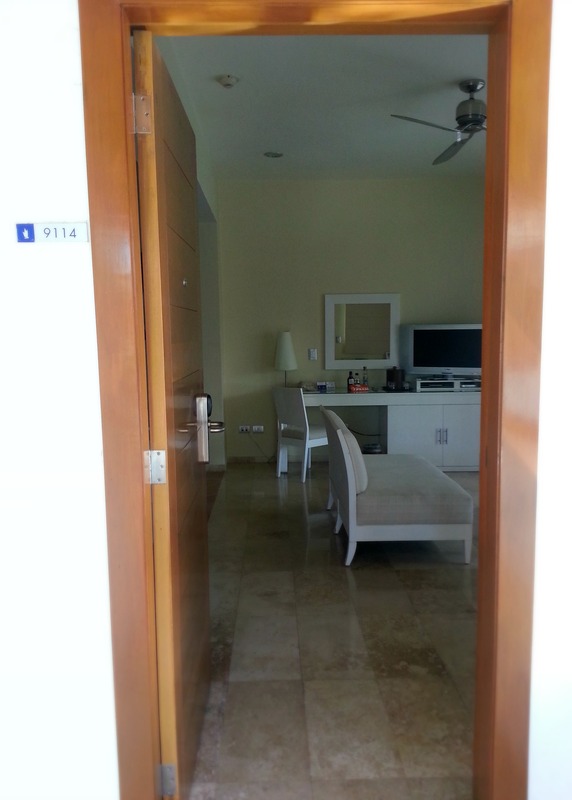 We stayed at the end of May, 2014, in the Laguna Villa Suites. 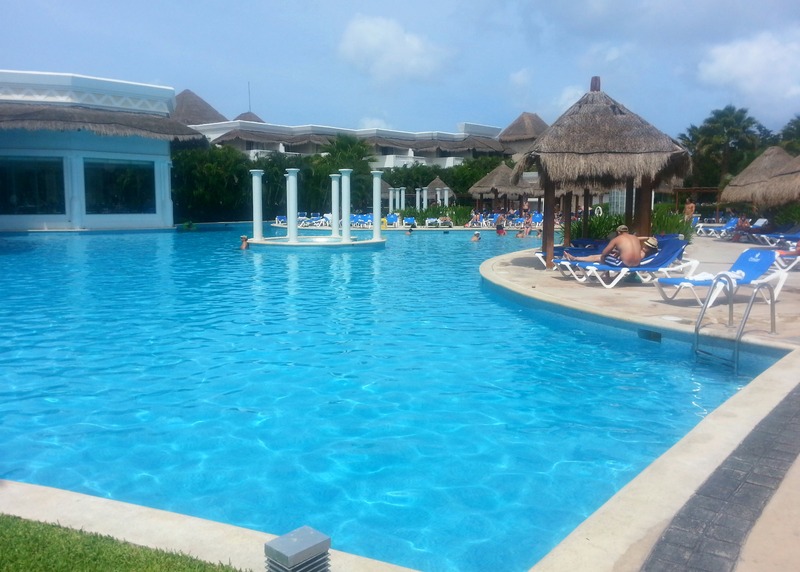 The Grand Riviera Princess is a HUGE all-inclusive resort on the same grounds as the Grand Sunset Princess resort. The Laguna Villas are beautiful adults-only suites with a private pool, exclusive pool bar and snacks, VIP concierge service, and free wi-fi. 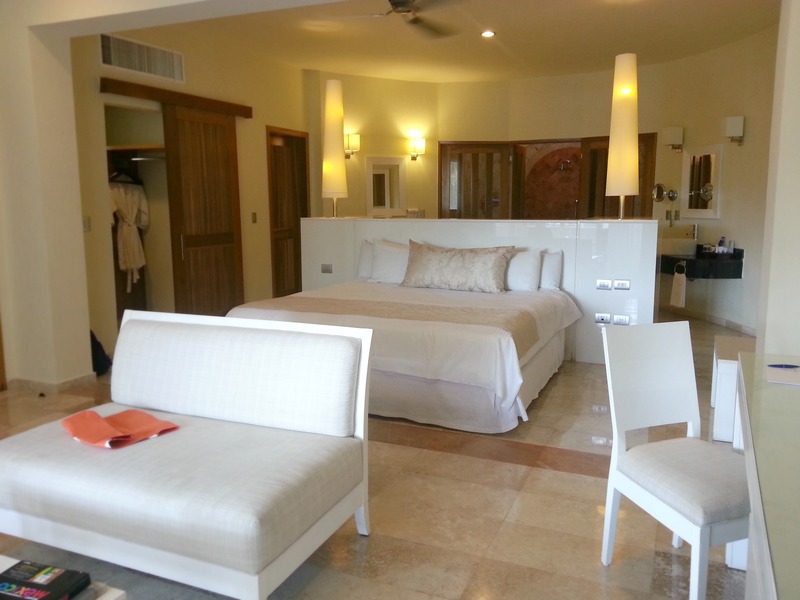 There are only 24 villa suites on the entire property (which, as I mentioned, is HUGE! 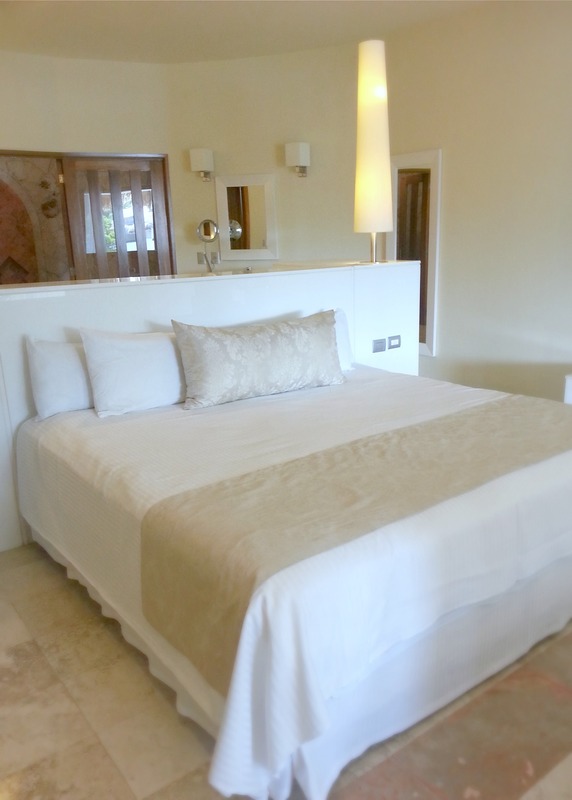 ), so you are a part of a small and exclusive group when you stay in the Villas. You also get “Platinum” status entitling you to higher-end drinks, access to the Platinum pools and lounges, reserved area on beach with drink service, VIP check-in, top priority restaurant reservations, and a lot more that I won’t go into… When we booked our stay in the Villas we also got a free massage & exfoliation at the spa, and access to the spa’s awesome hydrotherapy circuit (and sauna, indoor pool, etc.). 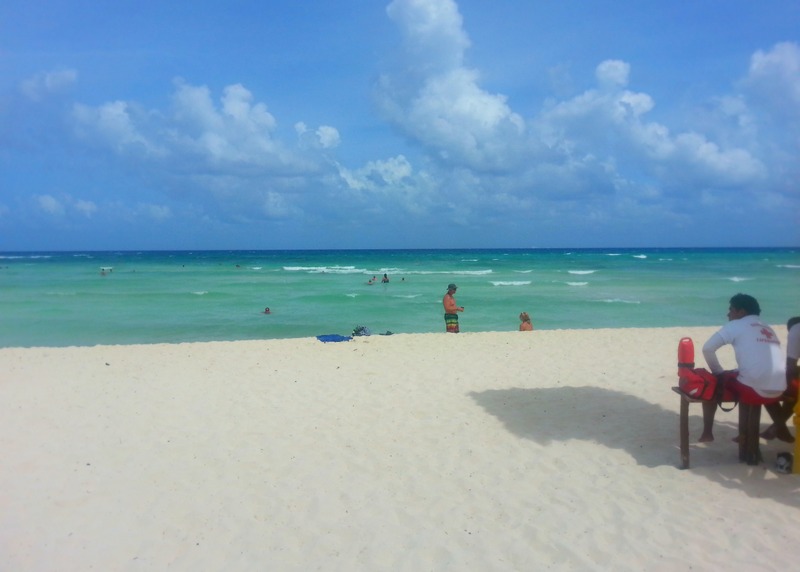 We did one excursion to the Mayan Ruins and beach at Tulum. I posted photos from that excursion here. 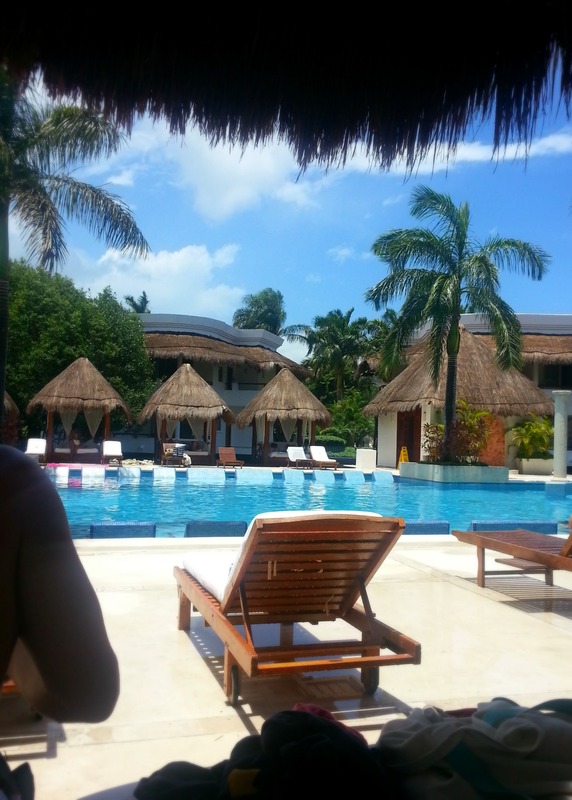 Tulum is beautiful and definitely worth visiting! 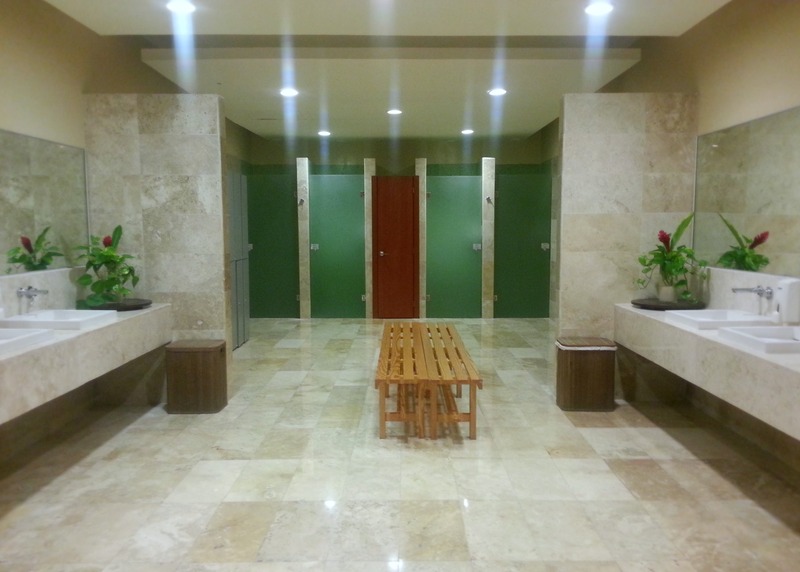 If you want more of the specific details on this hotel, check out my Trip Advisor review. Here is the view from the lobby, looking towards the lobby bar. The lobby bar is one of the nice places to sit back, relax, and have a drink after dinner. TIP:There are filtered water coolers on the side of the Riviera Lobby Bar and the Sunset Lobby Bar. You can get a cup of water or fill your water bottles there. 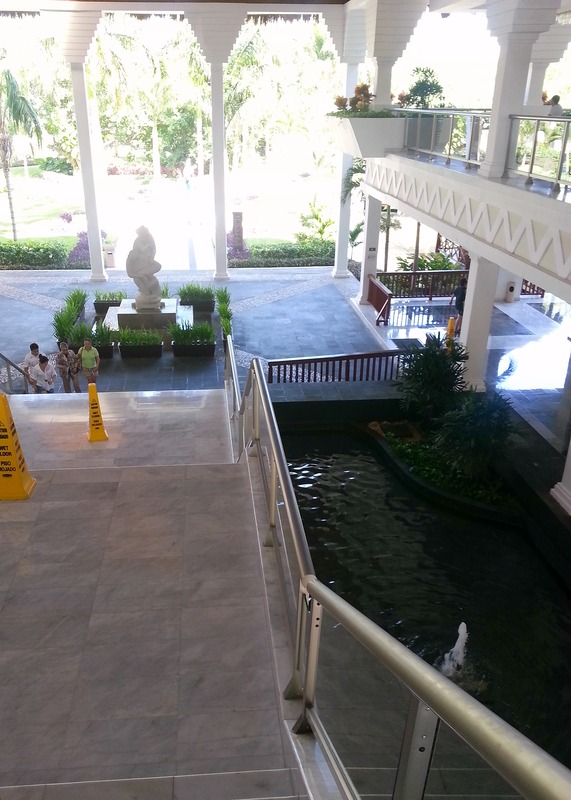 These stairs take you from the lobby down to the main resort area. 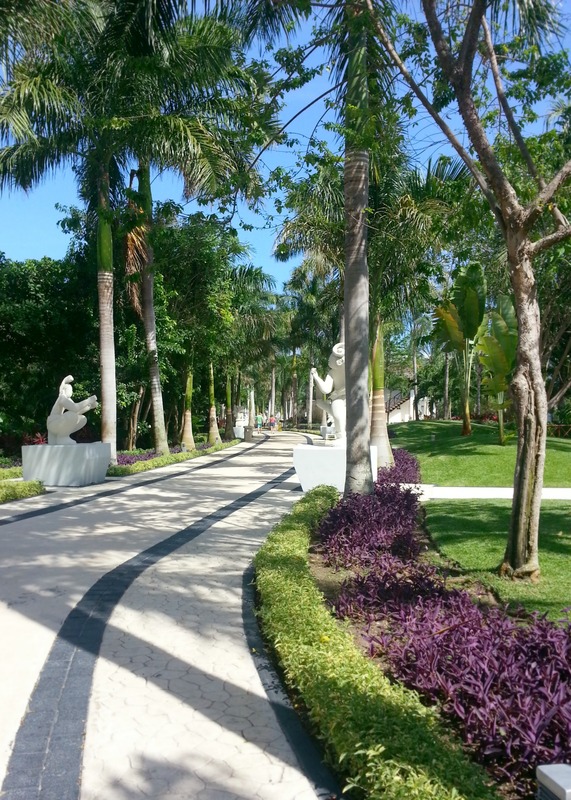 The main paths are lined with these pretty (Mayan-inspired) sculptures. Coffee machine under the window. 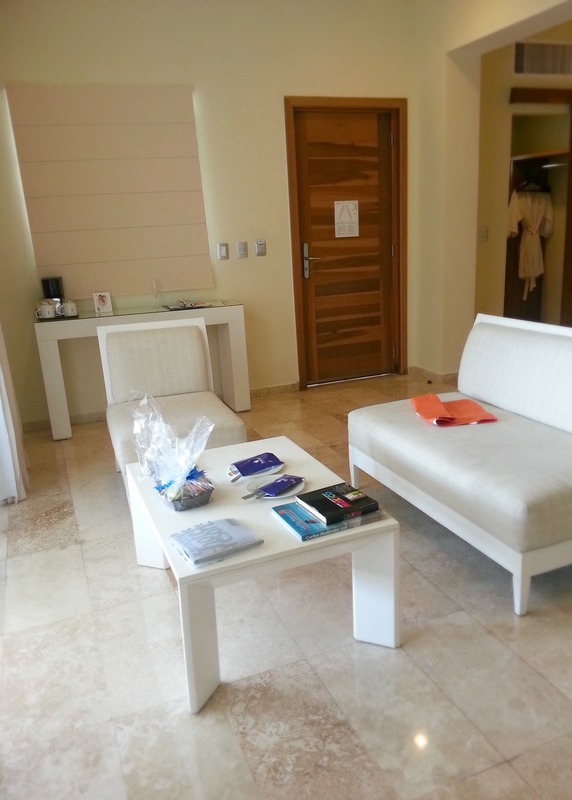 The orange thing on the chair is a complimentary beach bag. 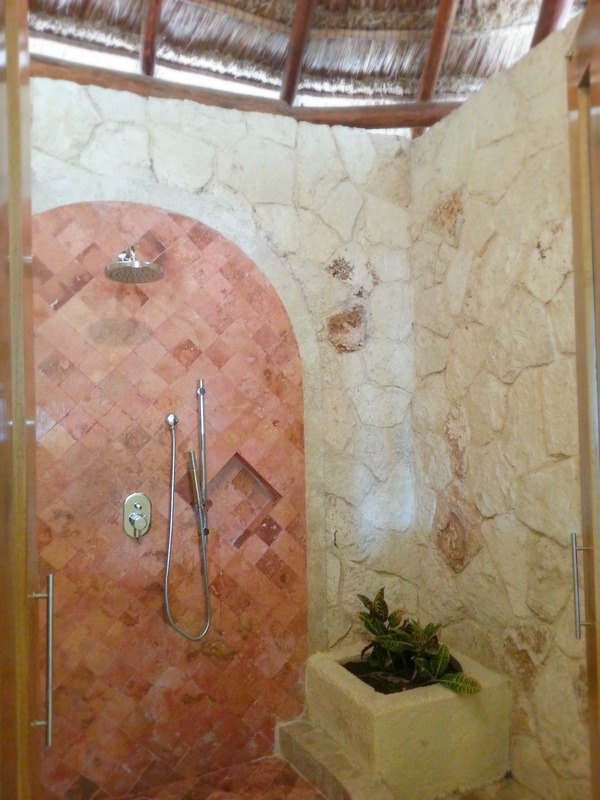 A beautiful outdoor shower, complete with Spanish tile. 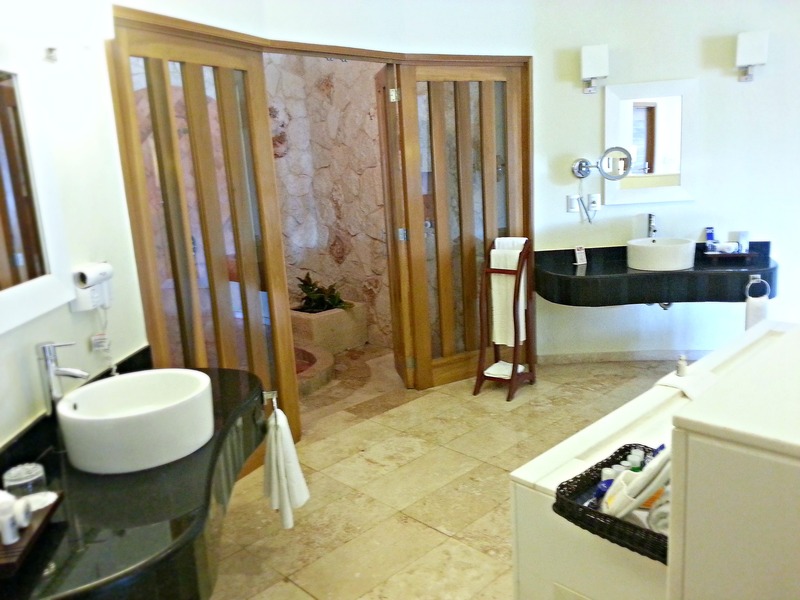 The 2nd-floor outdoor showers are covered with a thatched roof, while the 1st-floor suites have an outdoor shower with no roof. 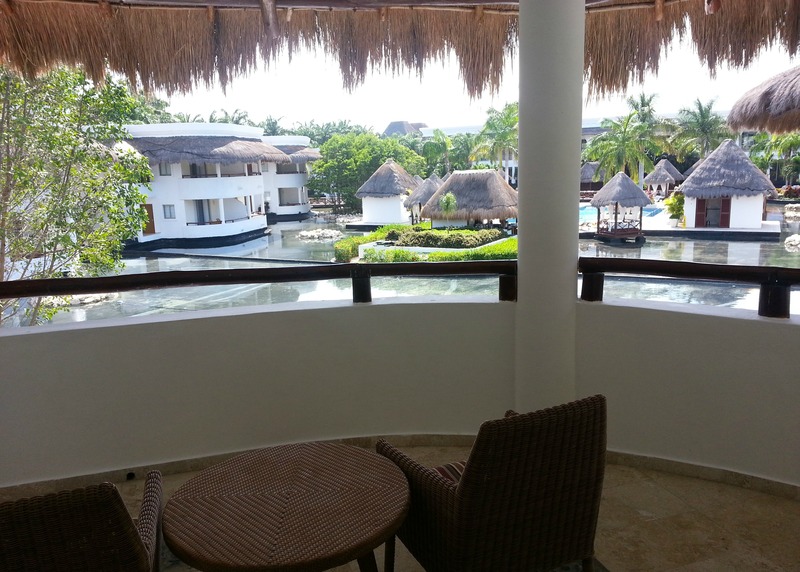 The seating area leads to a beautiful balcony overlooking the lagoon. Balcony view. You can see the private Laguna Villas pool and bar in the middle of the lagoon. 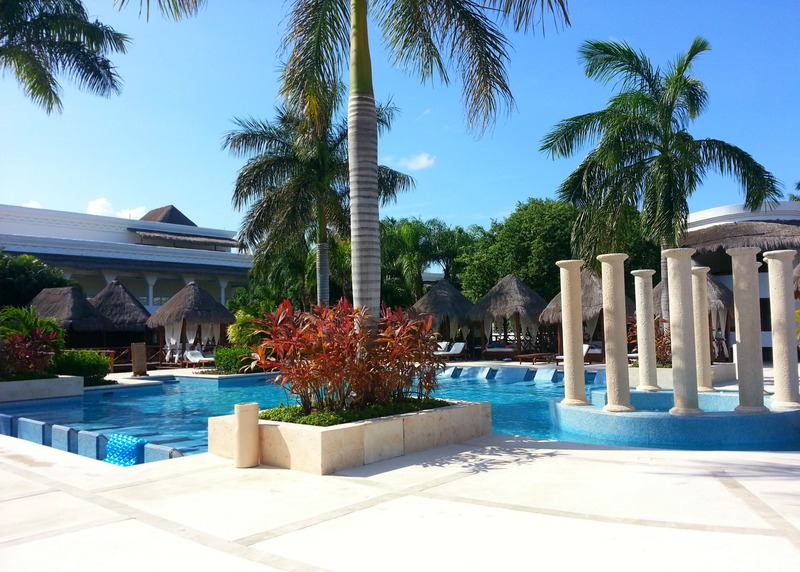 The Villas pool is surrounded by relaxing cabanas. 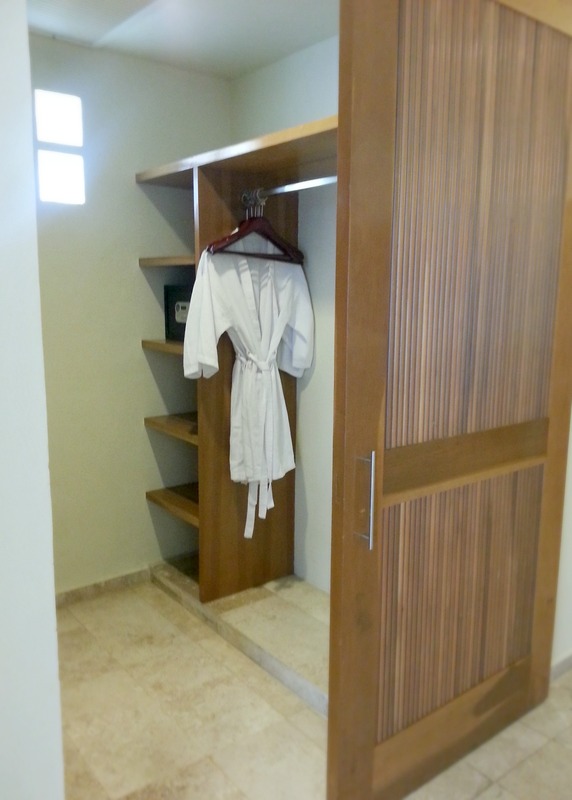 TIP:There are only 17 (or so) cabanas around the pool, and many of the Villas guests show up pretty early in the morning (before 9 am) to “reserve” a cabana by tossing a few towels and some personal belongings into their cabana of choice. 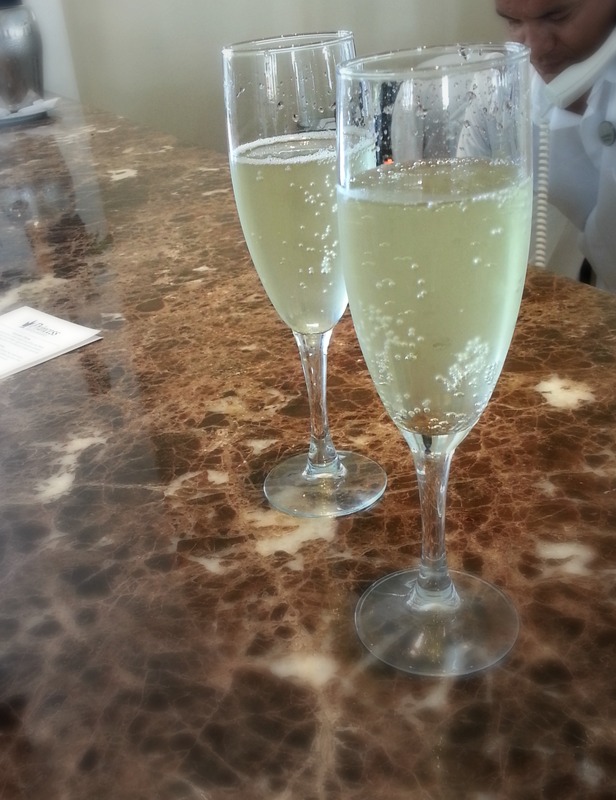 You can also see the private Villas bar in this photo. We got the best drinks at this bar. 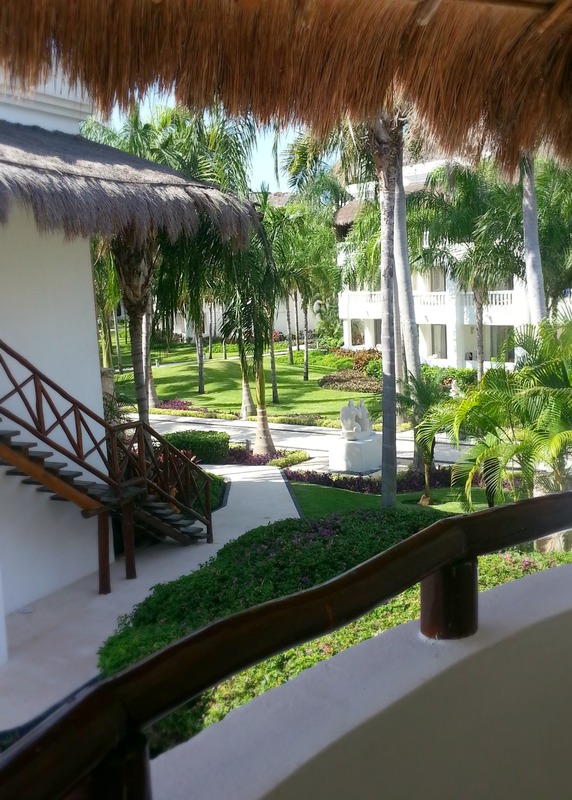 View of the main walkway from the entrance to our villa. 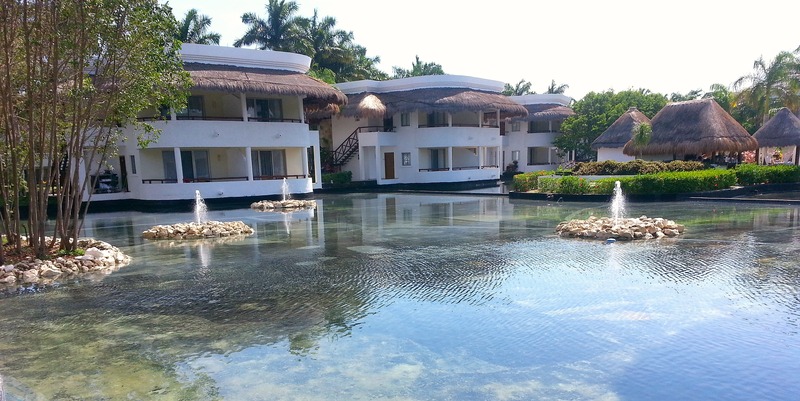 You enter a gate, and cross a bridge over the lagoon to reach the private pool, which is in the middle of the lagoon. This roman-esque structure in the middle of the pool has jets, but it is not heated like a hot tub. 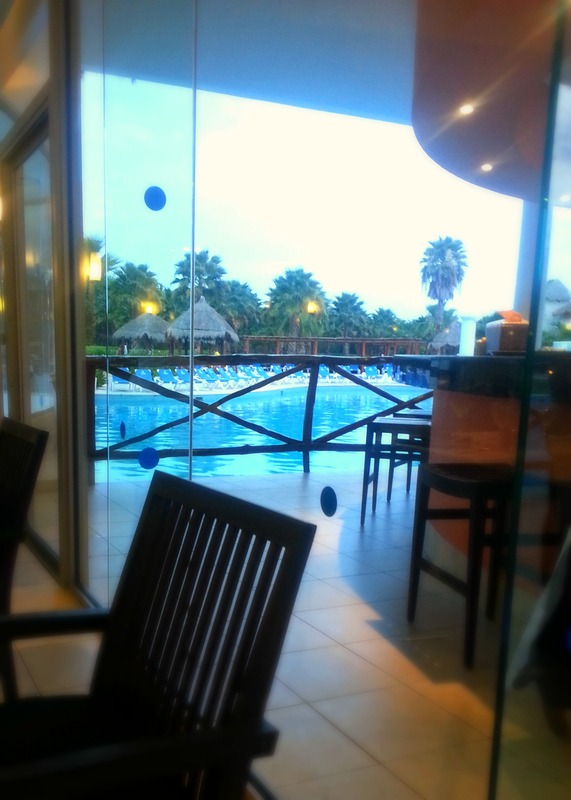 The pool water is a nice temperature, though. 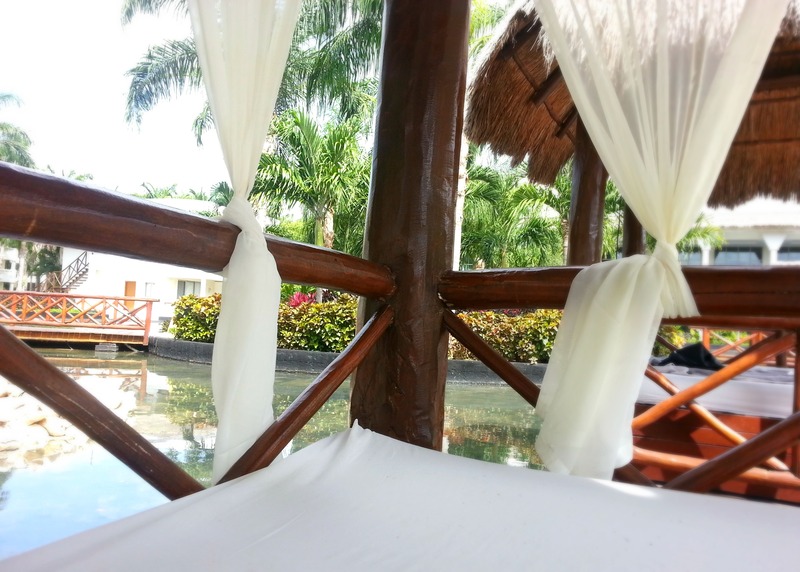 The cabanas face the pool, and there is a beautiful lagoon view behind the cabanas. The Villas pool has nicer lounge chairs with padded cushions. 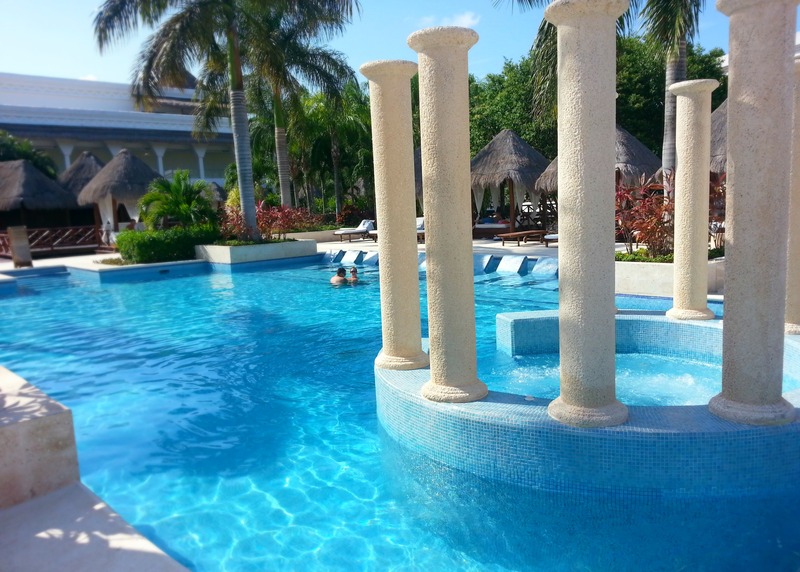 The other resort pools have plain blue loungers. 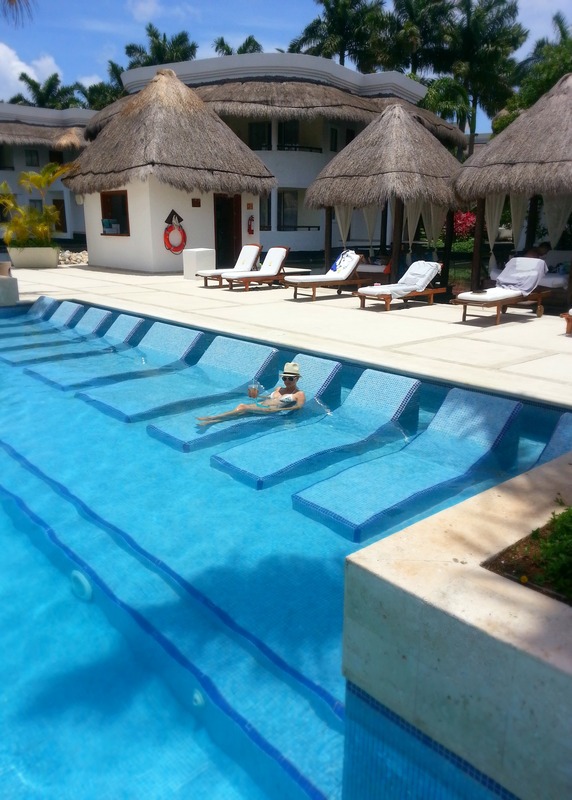 The Villas pool has these awesome “loungers” built into the pool, so you can get your tan and stay cool at the same time. The Villas concierge is located in the small building to the left in this photo. 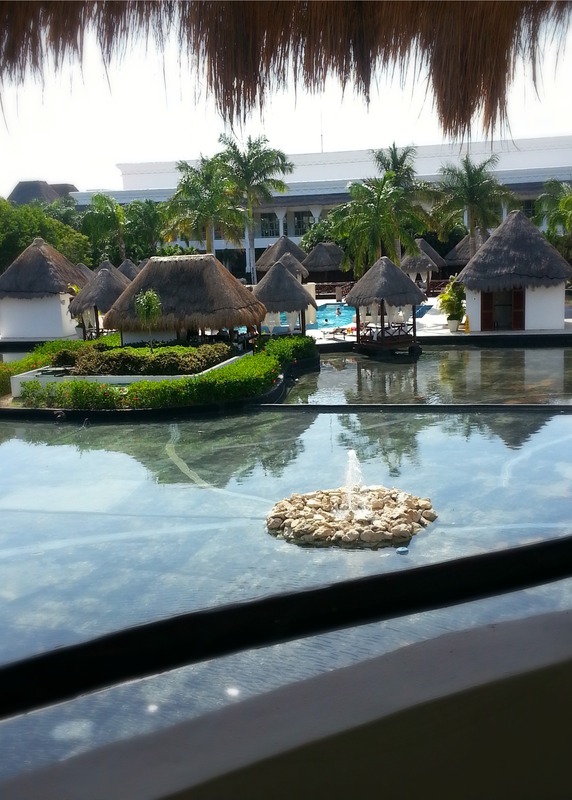 Moving away from the Villas now, here is one of the main hotel pools. I call it the “party pool.” You can see the swim-up bar in the background. 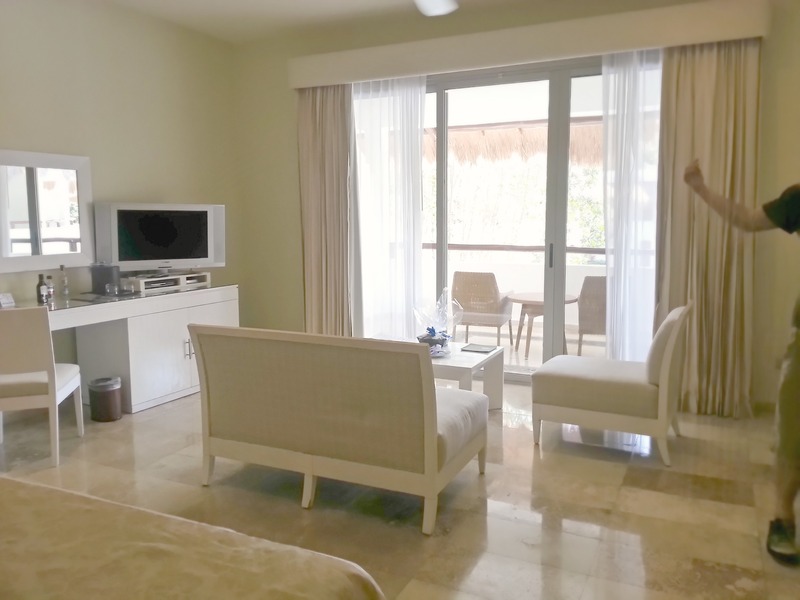 The nice thing about staying in the Villas is that you can choose if you are in the mood to relax at the quieter Villa pool, or have fun at one of the “party” pools. Here is another large pool (there are many!). This one is in front of the Riviera Snack Buffet. 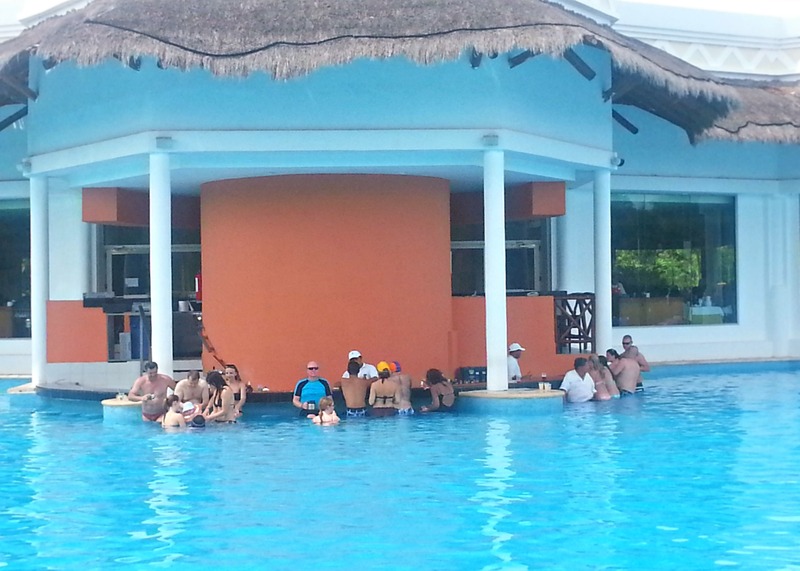 This swim-up bar is in the pool pictured above. 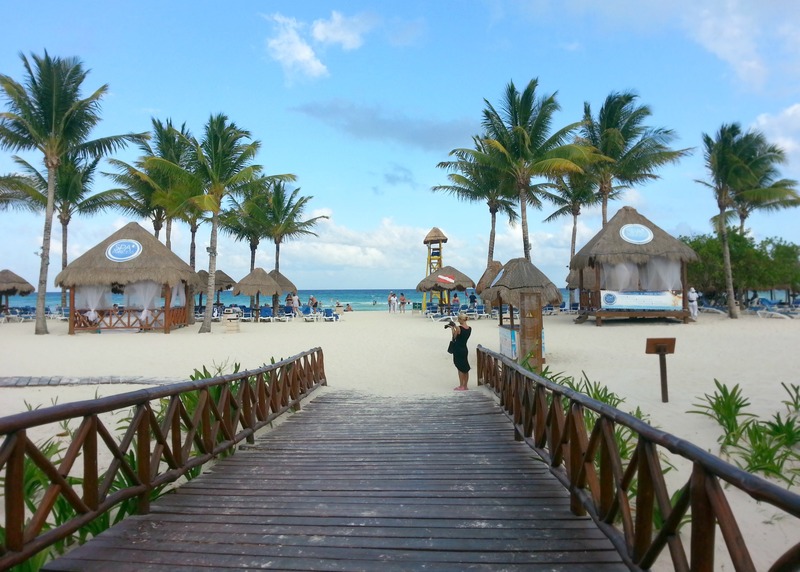 Here is the main walkway leading to the beach. You can get spa services, including massage, right on the beach. You can also sign up for scuba diving and other water activities. 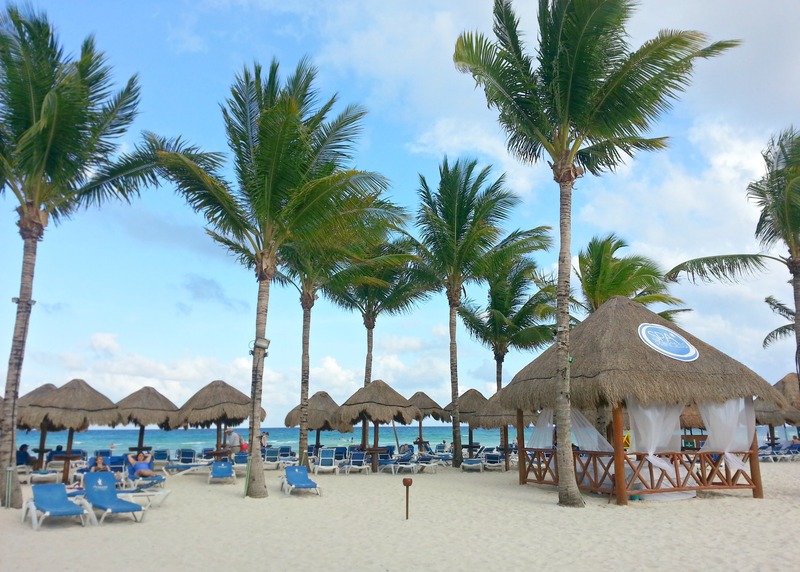 The resort’s beach area is large and has plenty of lounge chairs for everyone. There are also many shade palapas. This photo is a very tiny section of the large beach. Here is the beach bar. 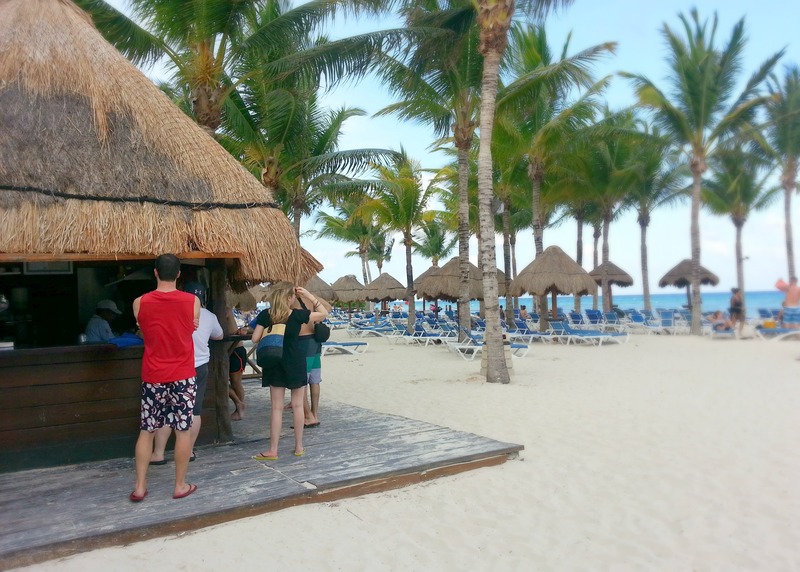 Another awesome thing about this resort is the beach BBQ, which is right behind the bar. You don’t have to leave the beach to get a snack (nachos, hamburgers, hot dogs, tacos). This is the view from the Platinum & Villas exclusive area of the beach. 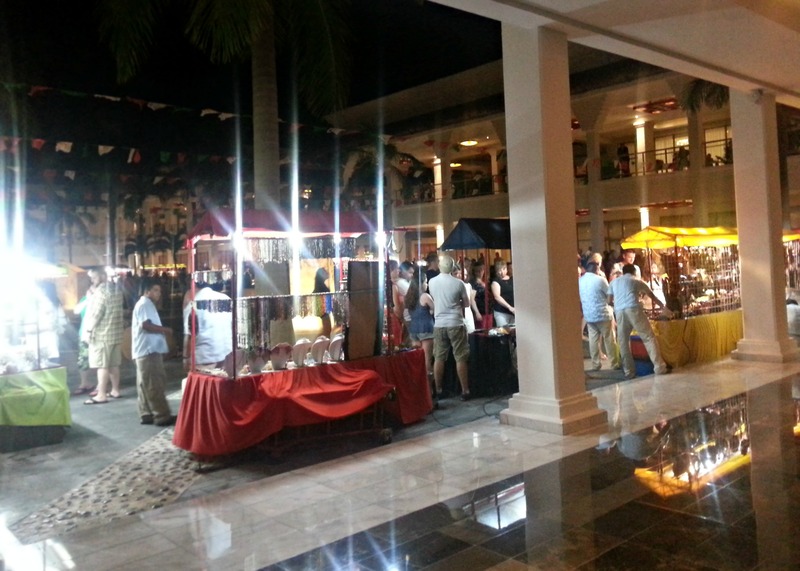 In the same plaza shown above, there was a marketplace one night during our stay. Local vendors brought their wares straight to the hotel. 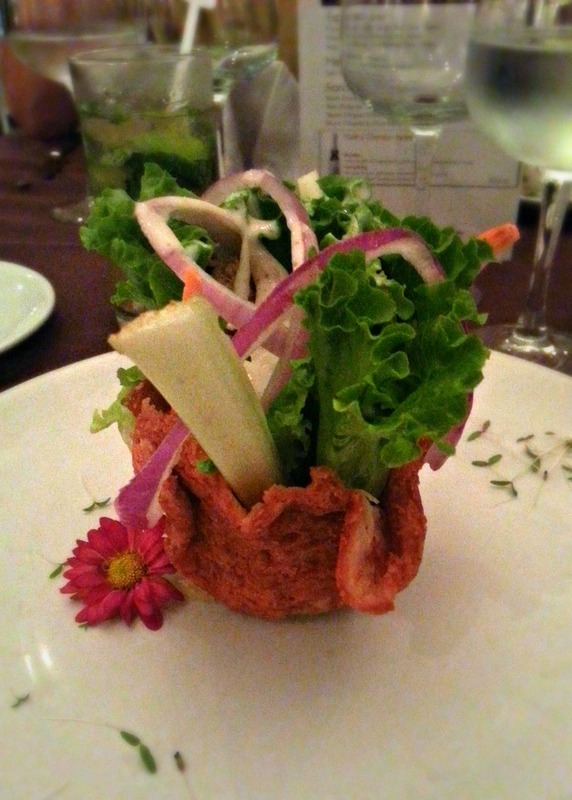 One of the salads at “La Fleur,” the fine dining restaurant. 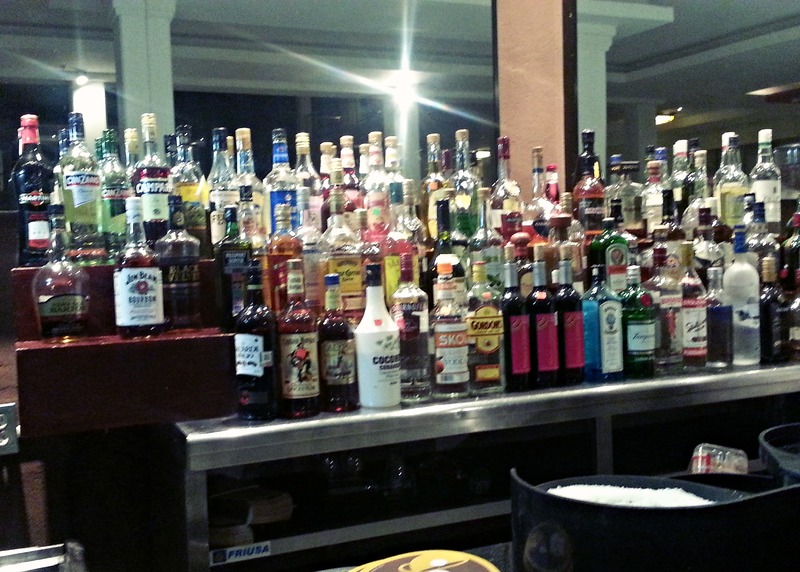 Large selection at the Plaza Bar. 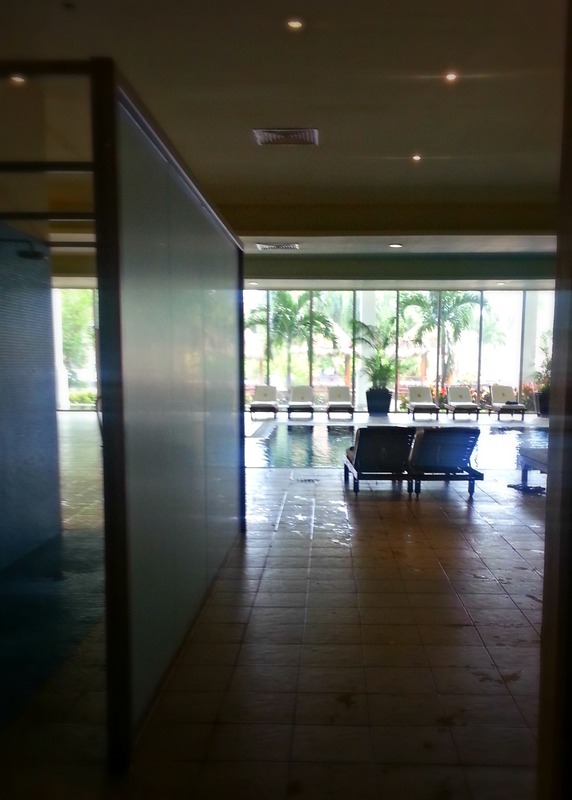 Indoor pool at the Spa. The windows overlook a beautiful lagoon. 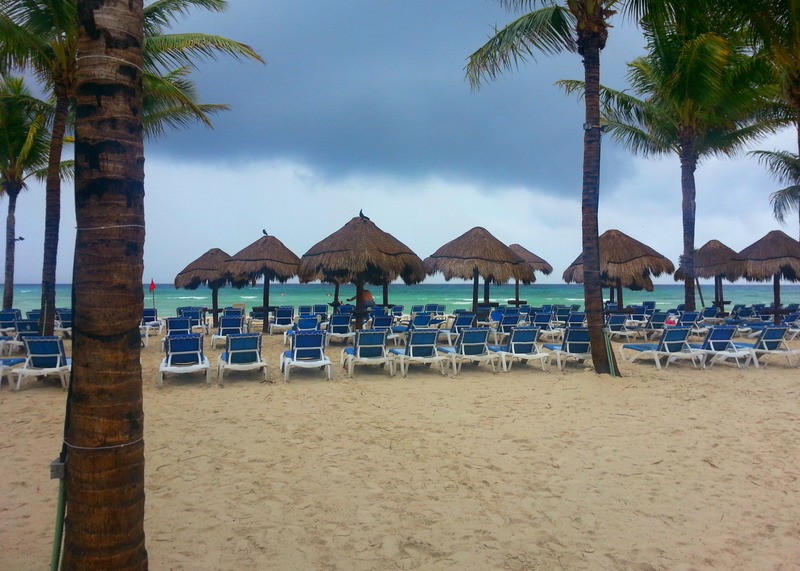 Here are a few pictures of the beach, deserted in the rain. And, finally, a map of the resort grounds (both the Grand Riviera Princess, and the Grand Sunset Princess). Click map to enlarge. Very nice overview. Thank you for the tour. 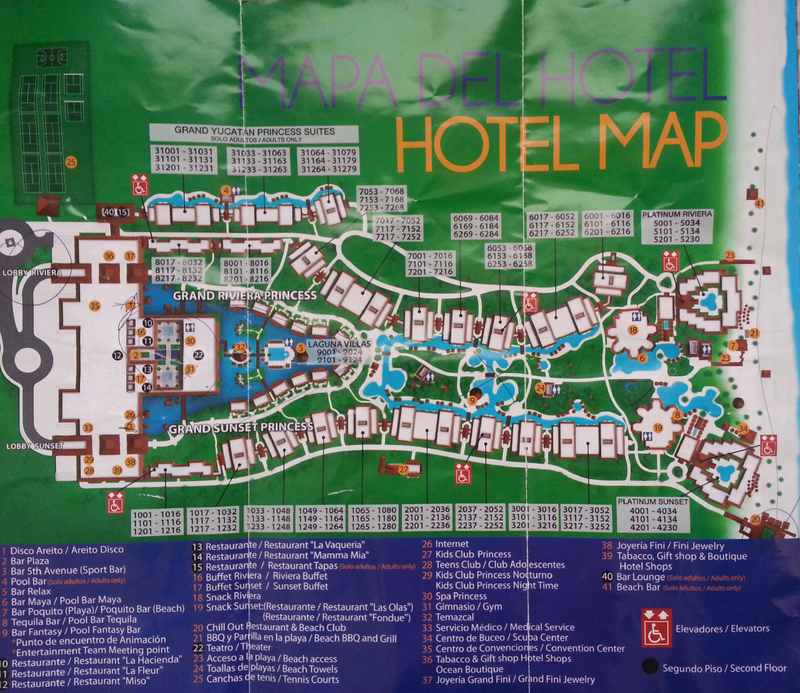 Hello, I just added a picture of the hotel map to the bottom of the blog. 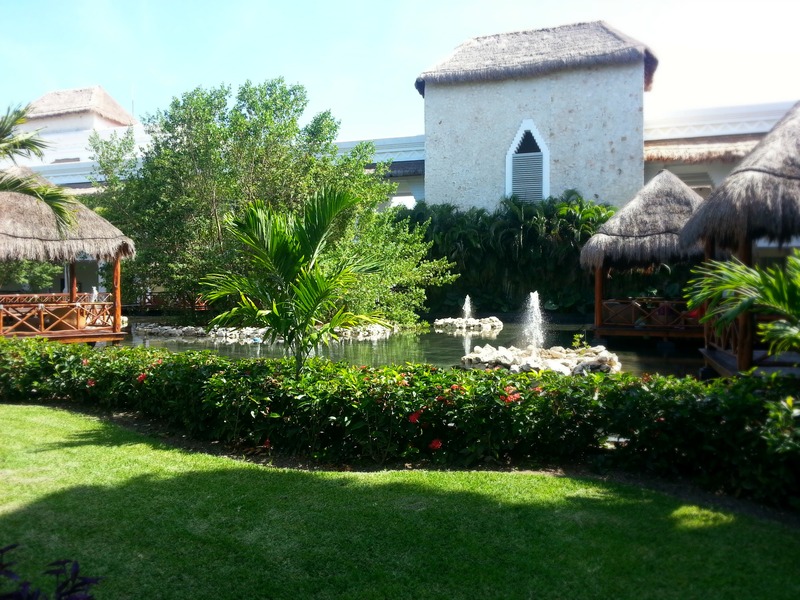 It shows the Grand Yucatan Princess Suites, although we never did walk over to that area of the hotel. I’m not sure if construction is completed yet, but they did include it on the map. 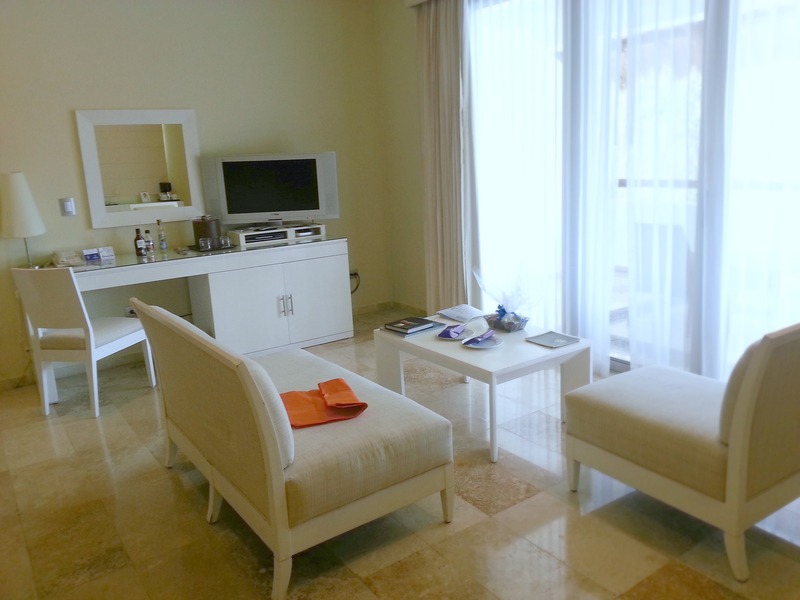 Platinum is great, as you will have access to the Platinum lounges and pools, free Wi-Fi in the Platinum lounges, concierge, easy restaurant reservations, access to the exclusive area of the beach, etc. 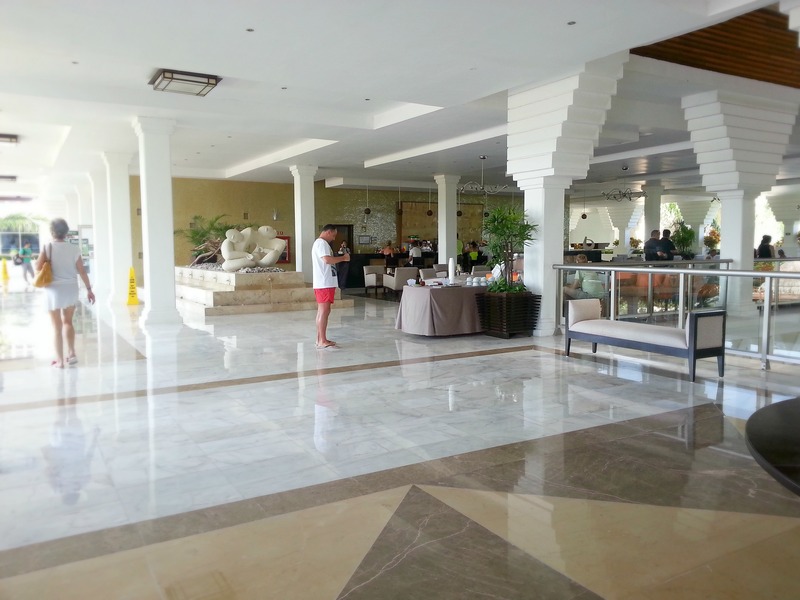 As far as my photo tour goes, you won’t have access to the Laguna Villas pool and bar. 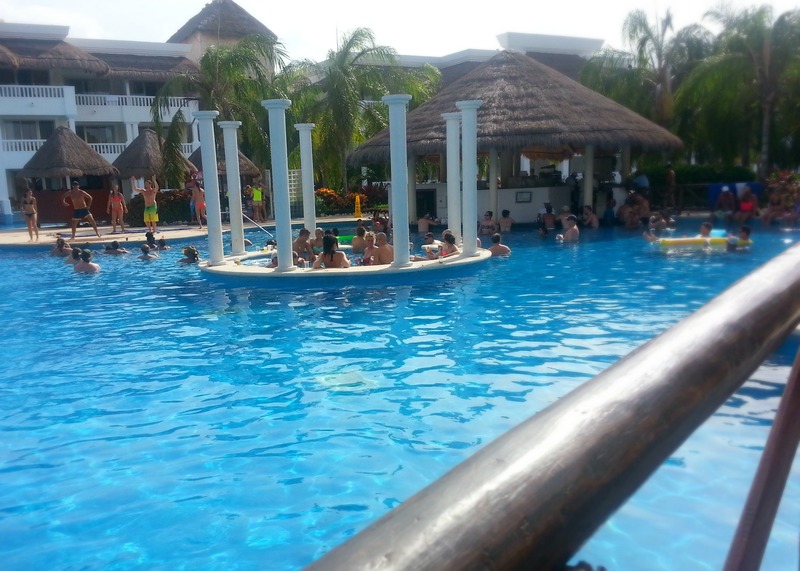 But the other pools (including the ones w/ swim-up bars) are open to everyone! 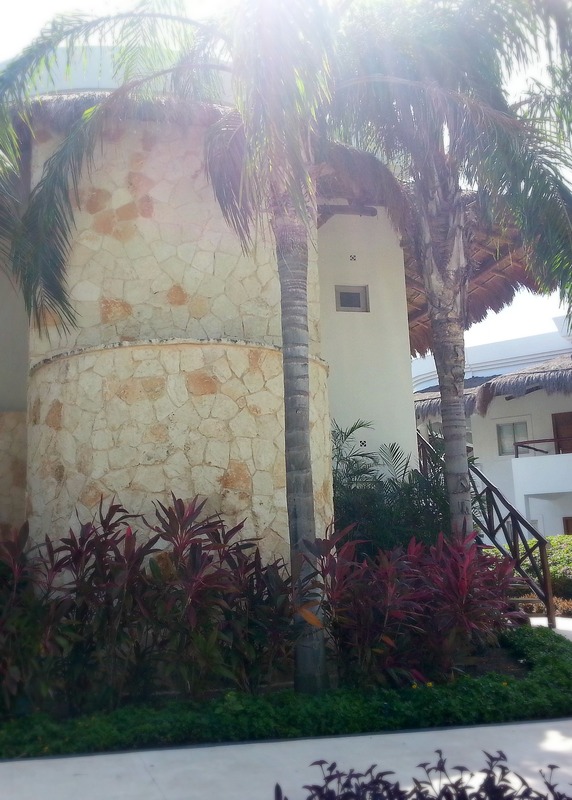 It also appears from the map that the Yucatan suites have swim-up rooms. Fun! 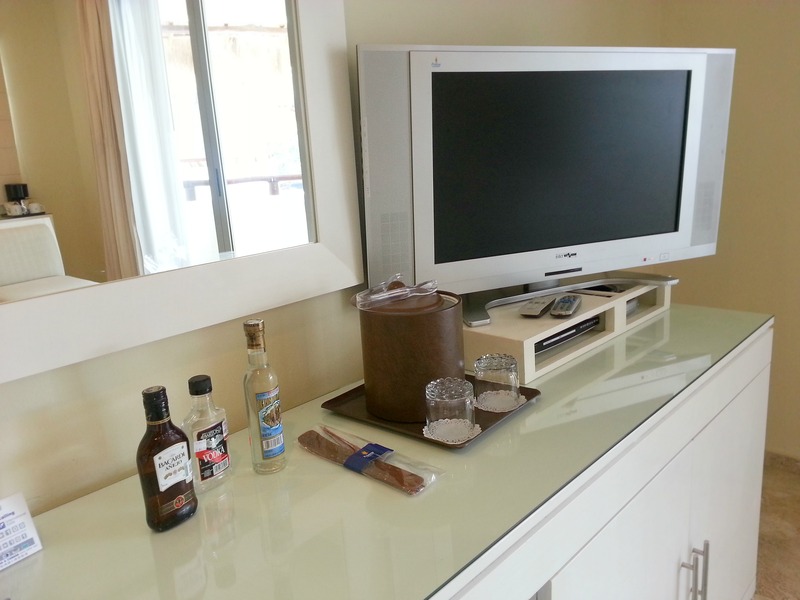 I’m sure you will enjoy your stay, as the resort is so beautiful and platinum status gives you extra amenities. I hope you have a great trip! Great post! I’m thinking of visiting the resort but some reviews say the Villa’s are quite far from the beach, did you find this to be true? Roughly how long is the walk to the beach? The walk to the beach was somewhere between 5-10 minutes. If you look at the map of the resort you will see that the resort is long and narrow. 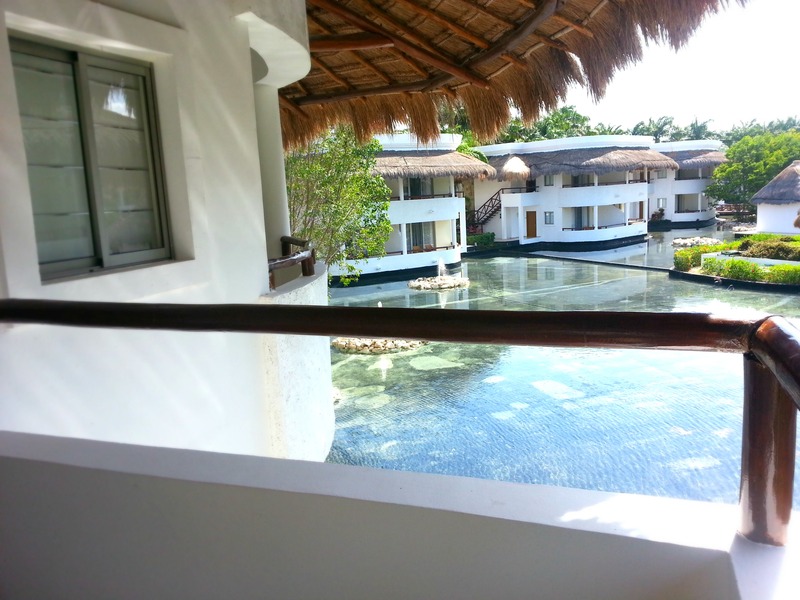 The villas are towards the front of the resort, and the beach is at the end of the resort. Personally, we found the walk to be quite enjoyable and it was not a problem at all. For those who aren’t able to walk due to health concerns, there is a golf cart shuttle that runs up and down the paths of the resort. But I don’t know how often it runs. 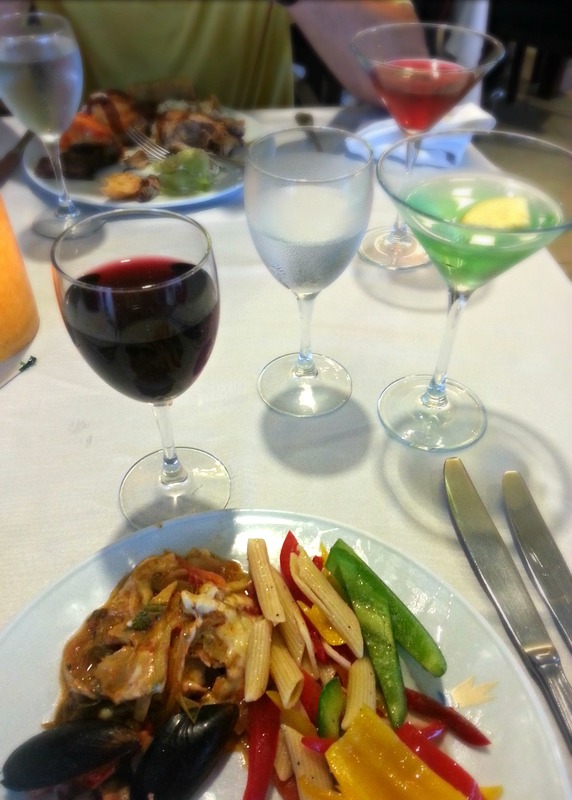 If you are staying at one resort (sunset for example) are you able to eat/hang out at all the others? Yes, it is like one big resort, and you can’t even tell where the boundaries are. We are heading there in 3 weeks. Is it true there are vendors on the beach and to sit on chairs by the watet you have to rent? Hi Sandy — I never saw vendors on the beach when we were there. 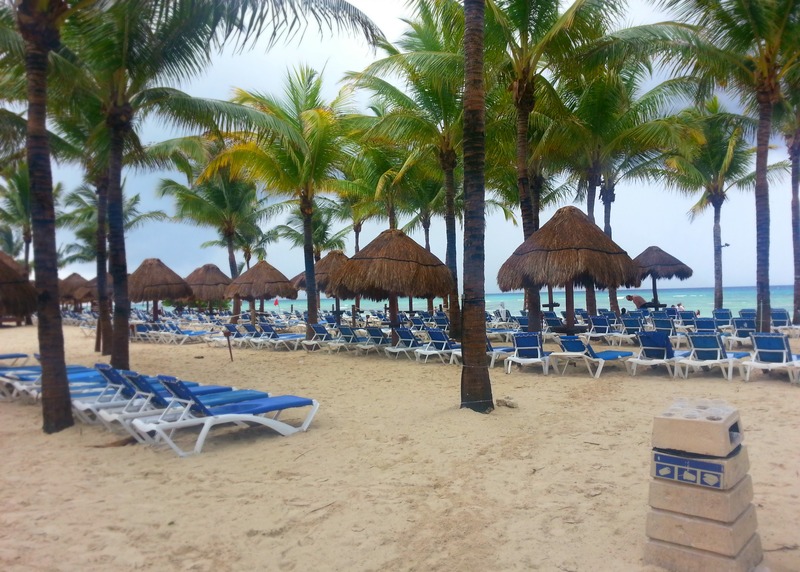 And there are plenty of lounge chairs on the beach for hotel guests that you do NOT have to rent. 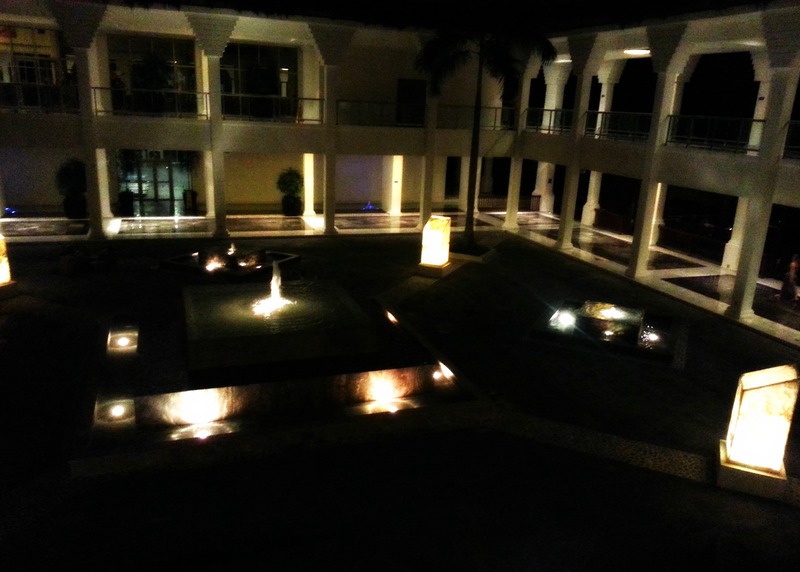 It is part of the resort property. There are, however, certain areas on the beach that are only accessible to certain resort guests, like a VIP area for platinum guests. Enjoy your trip! Hello! Wondering, I see on their website it says they have 4 kids pools. Did you happen to see those? And do they by chance have anything unique about them– such as any kind of pool slide, etc? Hi Katie! I did not notice any kids’ pools when we were there. But when we were there, there were certain areas under construction. And I know they opened a kids’ day camp area after our visit. So those kids’ pools might be part of the newer areas. Were there lots of mosquitos too? Is there a worry about the Zika virus there? 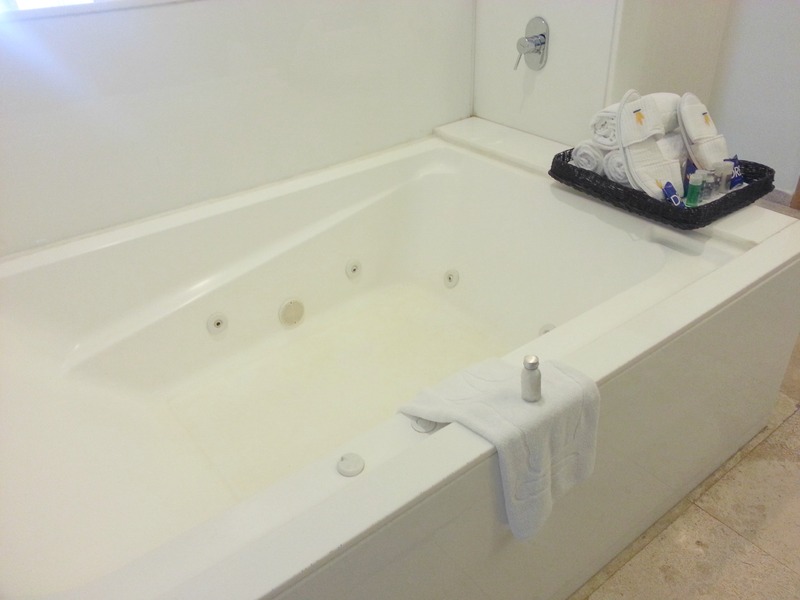 I don’t know about the platinum rooms, since we stayed in a different upgraded area of the resort. 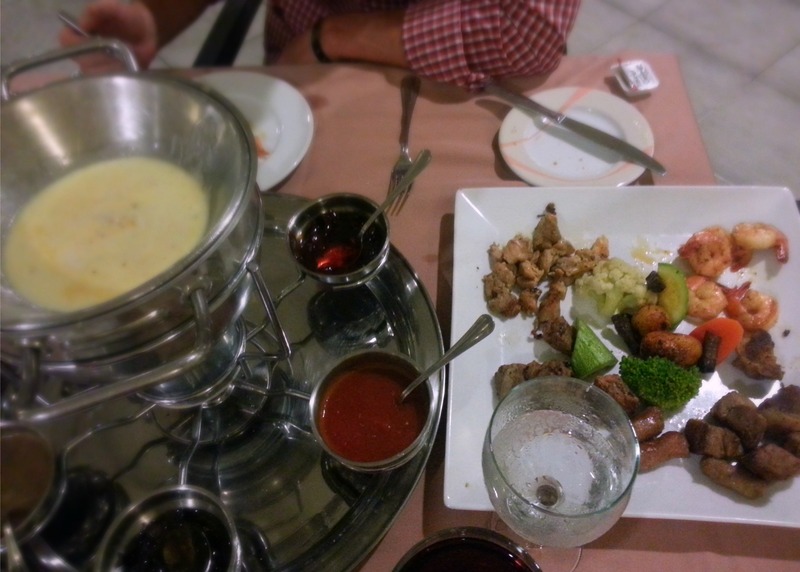 We saw some mixed reviews before we went, but we were very pleased with the food and service. Mosquitos were not a problem. But our visit was 1.5 years ago. we are going there in Feb 2018 and staying at Laguna villas. Your pictures are awesome and answered some of my questions. Thanks!! !